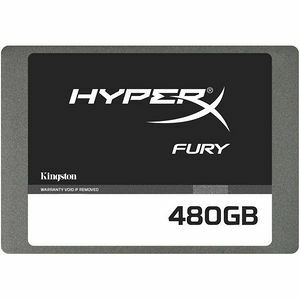 HyperX® FURY SSD offers high performance at an affordable price, to get you in the game faster and improve boot times, application loading and file execution. Maps and levels in games load faster with increased frames per second, thanks to its SandForce® SF-2281 controller with SATA Rev 3.0 (6Gb/s) performance and read/write speeds of 500/500MB/s1. Available in 120GB-480GB capacities2, HyperX FURY comes in a slim, 7mm SSD form factor to fit in most standard 2.5" notebook storage slots.